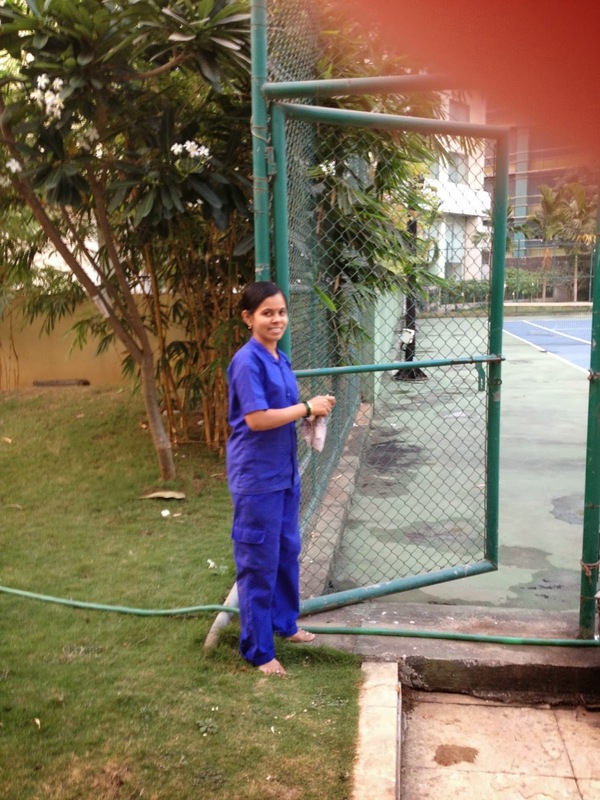 Playing tennis in Kurla, our neighborhood in Mumbai, is an experience that needs photos to tell the entire story. First, you must walk down the street in your culturally insensitive tennis outfit. You hope that by carrying your tennis racket you are signaling that you are very aware you are wearing a short skirt and sleeveless top, but this is the outfit you wear when you are going to play “LONG TENNIS.” If you happen to be on your way to the club between 4:00 - 5:00 you will pass the garbage truck. Now passing a garbage truck in Mumbai is not like anything you have ever experienced before. The garbage which you (or your housekeeper) placed in a black plastic bag and set outside your apartment door has been dumped on the road along with everyone else’s garbage in your entire apartment complex. 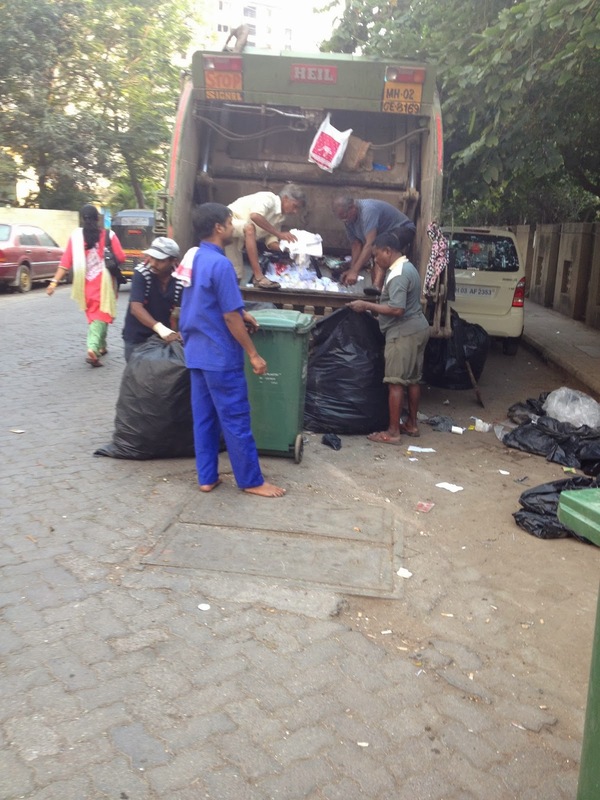 There are men behind the garbage truck sifting though the garbage. You suppose the garbage is being sorted into recyclable items, but you walk on the other side of the street to avoid all the neighborhood dogs that have gathered for a tasty meal. Sometimes you are extra lucky and the dogs follow you to the other side of the street. After you cross the street, you enter the club. A young woman that works at the club unlocks the gate. Then you and your tennis partners begin to play. It takes a lot of concentration to play tennis in Mumbai. Just as you are getting into your stride, the workers at the club come to sweep the area around the court. They laugh and talk as they bend low to sweep with their short, branch-like brooms. 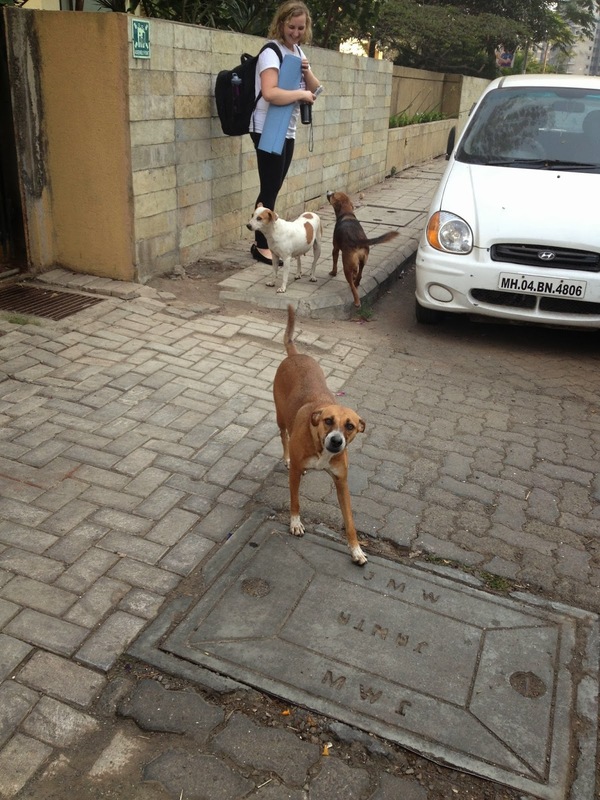 Then the stray dogs, one who has two puppies, run past the court to romp on the cricket field next to your court. Sometimes there are men or boys playing a match of cricket. Sometimes the match is accompanied by a loud speaker with drums, music, singing, or announcements blaring at decibels sure to permanently damage your hearing. Do not let your attention wander even if you notice bright lights and sparks from men installing a window grill without any safety equipment on the twelfth story of the high rise apartment building that towers over the club. 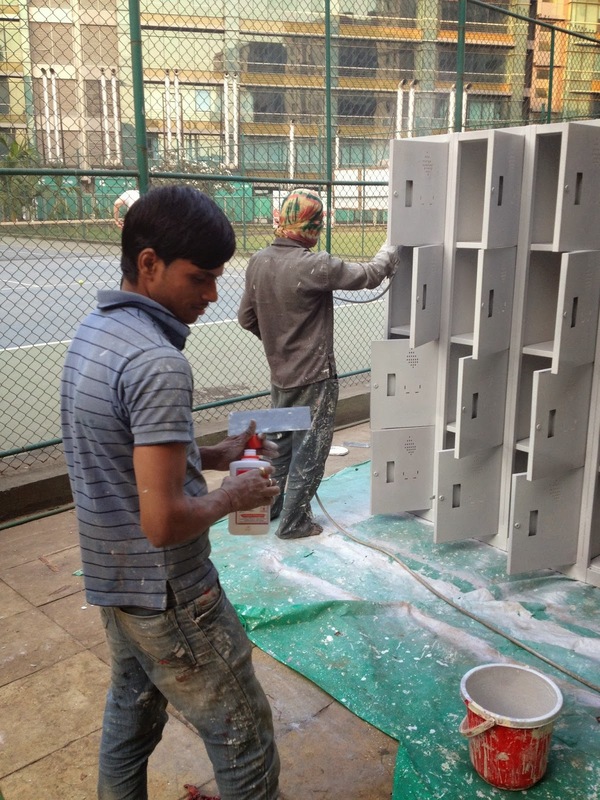 Do not let your attention wander even if workers are painting lockers with a power sprayer two feet from the court. Playing tennis in Mumbai also calls for a certain amount of confidence as well. 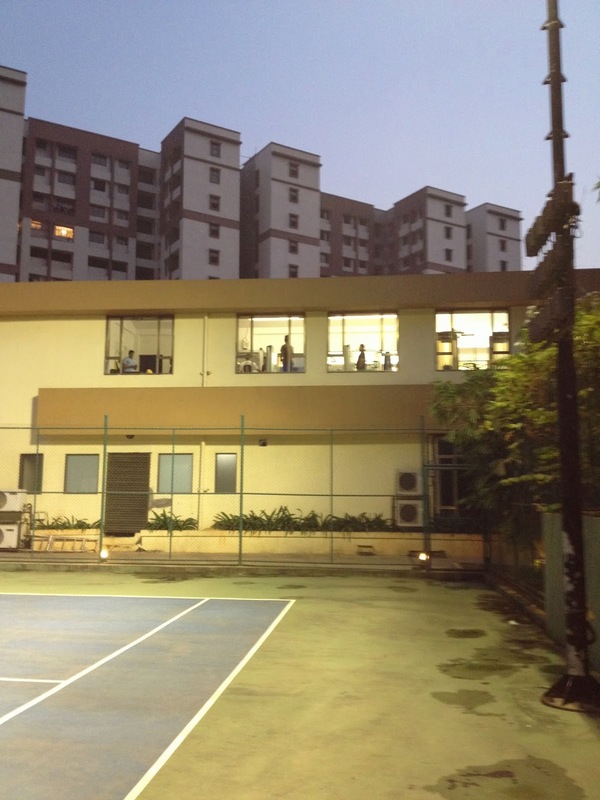 The fitness room looks over the court. Often you will notice men who are taking a break from the running machines watching you play in your short tennis skirt and sleeveless top. Your wandering eye might notice an audience of families sitting on their narrow balcony on the high rise apartment building. They are watching your match along with the young men sitting on window ledges. You hope they are enjoying the game. Playing tennis in Mumbai also tests your hearing. You must listen carefully for the distant call from the neighborhood mosque. The sound will float over the court at dusk. 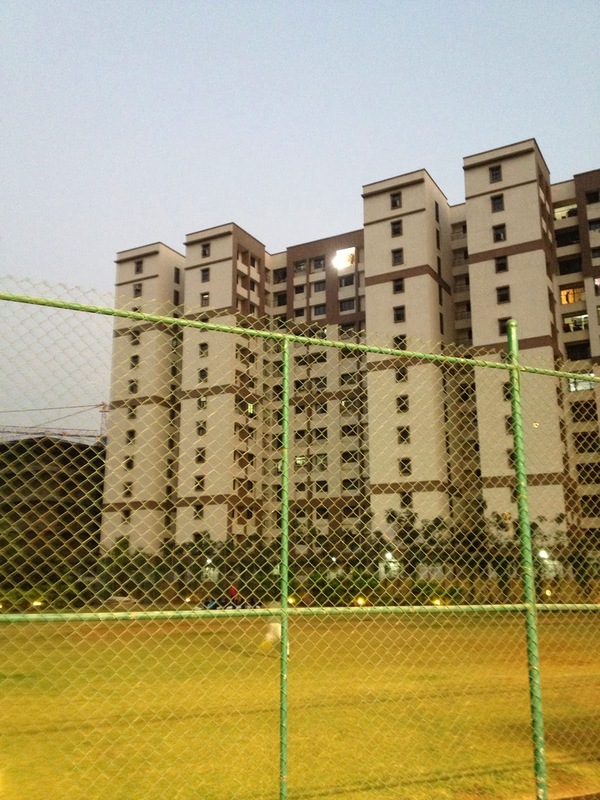 When you hear this call you must make a decision, “Shall we quit since it is getting difficult to see the ball or shall we ask a worker to turn on the lights?” No matter what your decision, you will be drenched with sweat and you will be thankful for the chance to play tennis in Mumbai.